Maya Altman and her mother, Robyn Altman, visit StoryCorps in Parkland, Fla., to reflect on the mass shooting at Marjory Stoneman Douglas High School. This story is part of the StoryCorps series of conversations. Last Valentine's Day, Maya Altman stepped out of her freshman biology class at Marjory Stoneman Douglas High School when she heard booming sounds. They were gunshots, she would later find out, from the mass shooting that took the lives of 17 people, including her friend Alyssa Alhadeff, in Parkland, Fla.
At StoryCorps last month, Maya, 15, recounts to her mother, Robyn Altman, 49, what happened that day. Maya describes a scene of utter confusion following the gunshots. "I saw people running in every direction," she says. "And in the blink of an eye, everyone was gone." Some students sought safety in classrooms; others looked for areas outside designated as places to go to during a fire drill, because a fire alarm was going off. A security guard ushered Maya to a classroom in a building across from the one where the shooting took place. The guard instructed the students to stay at the back of the classroom, lie down and keep quiet. Maya and dozens of other students huddled there for hours. She says few there understood the threat they were facing. "I don't think anybody really knew," Maya says. So when Maya's father, Adam Altman, texted her to find out what was happening, she didn't have much information to share. Adam was with Robyn at a cafe, where they overheard other parents say there was an active shooter on campus. Her dad asked her whether she was out of the school, but before Maya could respond, her phone battery died. Maya remembers that she was worried about an argument she had with her mom that morning. "I remember being like, 'My mom's mad at me, and I'm never gonna [get to] say I'm sorry,' " she tells Robyn at StoryCorps. Some three hours later, a SWAT team entered the classroom and evacuated students. "They had us run with our heads down and our hands on our heads," she says. "They were like, 'Don't look to your right. Don't look to your right.' "
But Maya couldn't help but look. "The doors were open and there were backpacks all inside, and it was red," she says. "Everything was a mess." "When you say, 'Red' ... meaning blood?" Robyn asks. It was a parent's nightmare. After arriving at the school and frantically scanning the sea of students flooding out of campus in groups, Robyn was relieved to find her daughter and know that she was safe. "When I saw you and I was able to touch, feel, hug you, I remember just not wanting to let go," she says. 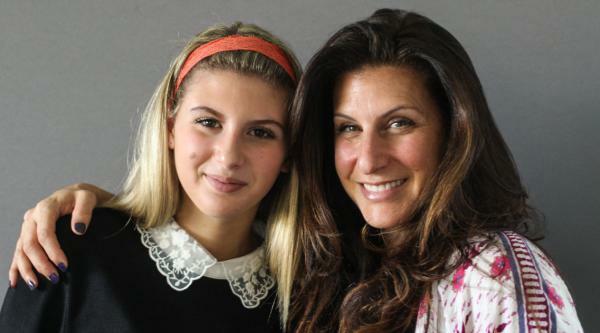 Following last year's mass shooting at Marjory Stoneman Douglas High School, student Maya Altman and her mother, Robyn Altman, embrace. Maya, though, felt something else. "I didn't really think, like, 'I'm so glad to see you.' I just wanted to leave," she says. She was still in shock and worried about the safety of her friends. Alyssa, her friend, wasn't replying to her texts. At home, Maya sent her messages asking where she was and if she was OK. "Alyssa never texted back," she says. "So I was just praying, 'Please let her be OK,' " she says. "And she wasn't." Maya asks her mom how she felt about sending her back to MSD when the school reopened two weeks later. "I remember just feeling so uneasy," Robyn says. "You decided to go in by yourself, and I remember thinking how brave you were." As much as she wanted to understand what her daughter was going through, Robyn acknowledges that she couldn't. But Maya says that talking to a teacher who also lived through that experience helped her cope. "I could talk to my creative writing teacher about things that I couldn't talk to you about, because she understood everything," she tells her mom. Robyn wonders how the shooting has affected how Maya envisions her future. Maya says she appreciates that her life isn't guaranteed. Before the shooting, she says, "I didn't really think that there was a possibility that I wouldn't grow up. You know? There was no possibility that maybe I might die at 15. "But once I saw some of my friends did, it was just like, I have a life. I want to do something. To feel worthy." For her sophomore year, Maya decided to transition to a home-schooling program, in part to ease some of the anxiety she felt on the MSD campus. Her mom says she is proud of how Maya has handled the trauma. "Seeing what you went through in this past year and seeing how you're sort of working through it, even on the toughest, toughest nights, I'm just so grateful," Robyn tells her daughter. "I'm just so grateful and proud of you."  Audio produced for Morning Edition by Camila Kerwin. Time for StoryCorps. 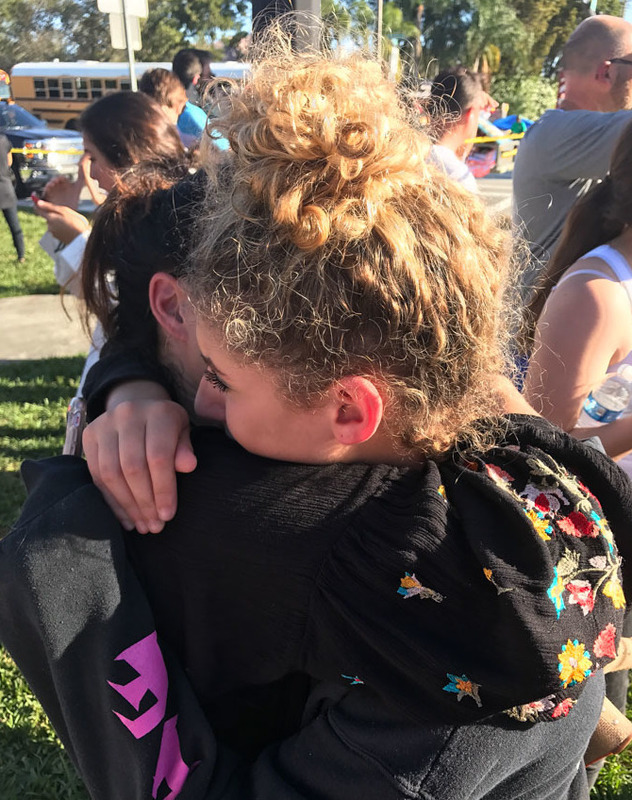 Last Valentine's Day, Maya Altman stepped out of her freshman biology class at Marjory Stoneman Douglas High School when she heard booming sounds. They were gunshots from the mass shooting nearly a year ago that took the lives of 17 people, including her friend Alyssa Alhadeff. At StoryCorps, Maya sat down with her mom to remember. MAYA ALTMAN: I saw everybody running in every direction. And in the blink of an eye, everyone was gone. I remember being thrown into the ROTC room. And I was told to go in the back, lay down, be quiet. ROBYN ALTMAN: So you didn't know yet? ALTMAN: I don't think anybody really knew. I was on 10 percent, and Dad was texting me. He said, what's going on? I said, I don't know. Do you see police? I said no idea. And he said, are you out of school? And then my phone died. And we were fighting that morning. I don't remember why (laughter). I remember being like, my mom's mad at me, and, like, I'm never going to say I'm sorry. After the SWAT came into my class, they had us run with our heads down and our hands on our heads. And they're like, don't look to your right, don't look to your right. And obviously if somebody tells you not to do something and you're a bunch of teenagers, you're going to do it. And the doors were open, and there were backpacks all inside. And it was red. And, like, everything was a mess. ALTMAN: When you say red, meaning blood? ALTMAN: When I saw you and I was able to touch, feel, hug you, I remember just, like, not wanting to let go. What was your experience when you finally saw us? ALTMAN: I didn't really think, like, I'm so glad to see you. I just wanted to leave. And I remember we went home, and I was texting Alyssa. And I was like, where are you; are you OK? And Alyssa never texted back. So I was just praying, please let her be OK. And she wasn't. How did you feel about sending me back to Douglas? ALTMAN: I remember just feeling so uneasy. And you decided to go in by yourself, and I remember thinking how brave you were. ALTMAN: I could talk to my creative writing teacher about things that I couldn't talk to you about because she understood everything. I mean, she got shot. ALTMAN: How do you think the shooting affected your ideas for the future? ALTMAN: I don't - I didn't really think about that there was a possibility that I wouldn't grow up, you know? There was no possibility that maybe I might die at 15. But, like, once I saw some of my friends did, it was just like, I have a life; I want to do something to feel worthy. ALTMAN: Seeing what you went through in this past year and seeing how you're sort of working through it even on the toughest, toughest nights, it's - I'm just so grateful. I'm just so grateful and proud of you. GREENE: Robyn Altman with her daughter Maya at StoryCorps in Parkland, Fla. That conversation will be archived along with hundreds of thousands of others at the Library of Congress.